For those who celebrate, Rosh Hashanah – the Jewish new year – starts Sunday night. And while opinions may differ as to what should be served, there’s no question that there should always be apples and honey. Apple slices dipped in honey are traditionally served for Rosh Hashanah, in the spirit of asking for a sweet year to come. As a result, many dishes feature one or both of these foods. My favorite? Hands down it’s honey cake (remember this recipe?). 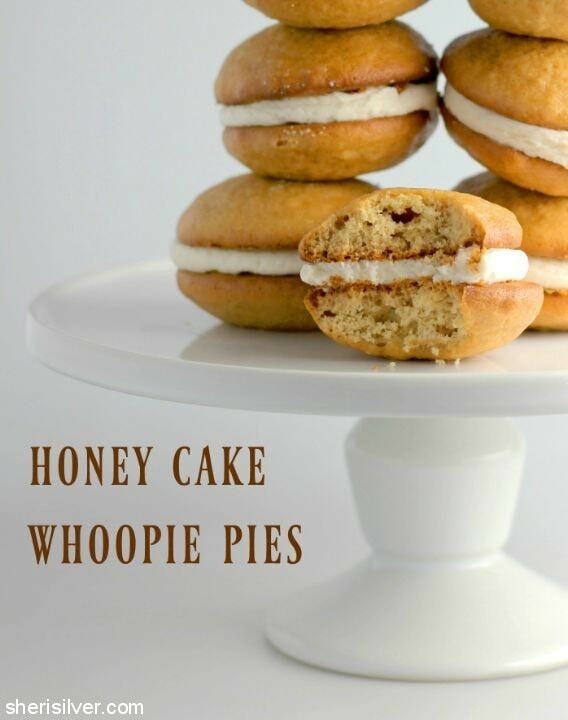 This year I thought it would be fun to make a twist on this beloved dessert, and came up with these delicious whoopie pies! Like soft little cakes, these whoopies are fragrant and lightly sweet, with a spiced cream-cheese filling. They’re perfect for a dinner party or dessert buffet; no slicing (or forks) required! Wishing you all a sweet and happy new year, school year, everything! In a microwave-safe bowl, or a metal bowl set over a pan of barely simmering water, melt the coffee, 8 tablespoons butter, sugar and 3/4 cup honey, whisking till smooth and emulsified. Cool for 15 minutes. Whisk in the vanilla, 1/2 teaspoon cinnamon and a pinch each of cloves and salt. Add the egg, baking soda/vinegar and baking powder; whisk again. Add the flour and switch to a spatula to mix ingredients till smooth. Let cool to room temperature and cover with plastic wrap; refrigerate overnight. Pre-heat oven to 325; line 3 baking sheets with parchment paper. Using a tablespoon or cookie scoop, scoop mounds of dough about 1 1/2″-2″ apart. Bake for 15 minutes or till golden brown (do not overbake). Transfer cookies to wire racks to cool completely. 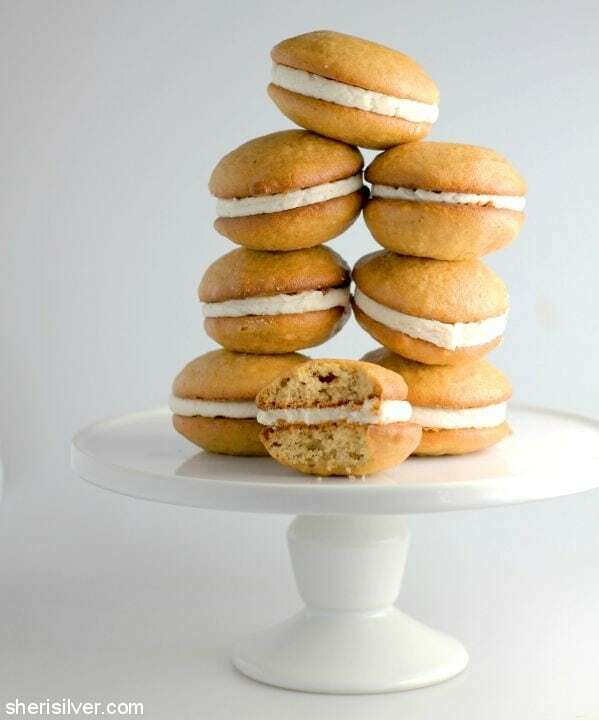 While cookies are cooling make the filling: beat the remaining 5 tablespoons butter and cream cheese in a mixer till light and fluffy; scrape down the sides. Add the remaining tablespoon honey and a pinch each of cinnamon, cloves and salt – beat again and scrape down the sides. With the mixer at low speed gradually add the confectioner’s sugar. Increase speed to medium and beat till the filling holds its shape. Transfer to a piping bag (or ziploc bag) and snip a 1/2″ opening in the corner. Turn half the cooled cookies over so that the flat sides are facing up. Pipe a dollop of the filling onto each of the bottoms. Top with the remaining cookies, pressing down slightly so that the filling spreads to the edges. Chill the pies for 30 minutes or up to 3 days; take out about 30 minutes prior to serving for the best texture/flavor. 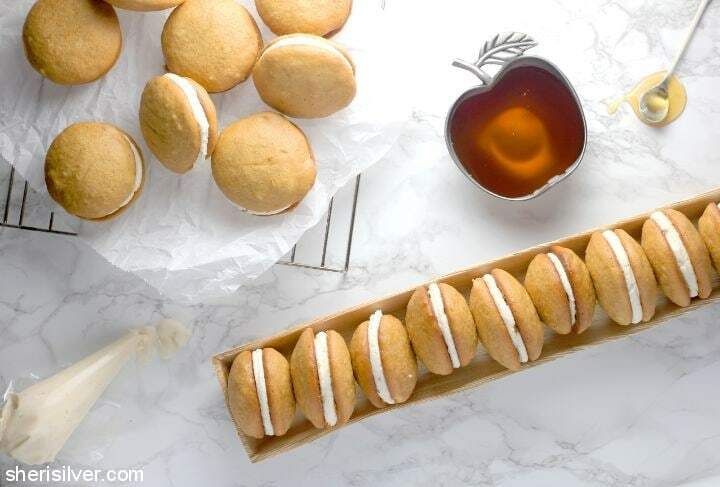 All the cookies on Pinterest, and you’ll find more Rosh Hashanah dessert ideas on The Nosher!